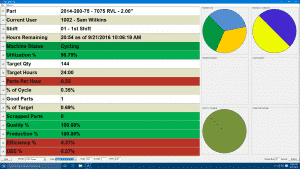 Capturing real-time data from the shop floor does not have to be complicated. Using your existing infrastructure and computers, our data collection solution Predator MDC can be added to your equipment with ease. Here is info on Data Collection for CNC Machines made simple. Works with any type of CNC control, including Mazak, FANUC, Haas, Okuma, Siemens, and Cincinnati. Compatibility also includes Robots, press brakes, bar feeds, welders, and more.